I received a review copy of this book from Kids Can Press and I have to say that it is one of the most unique book of Nursery Rhymes out there. I've been looking for a book of rhymes that my son might enjoy and this is the first one (out of a long line of nursery books) that has held his attention for any period of time. For starters, the pictures flow together telling an overall story instead of making each rhyme a separate story unto itself. One example would be that of a particular two page spread that shows a kitchen scene with the animals mixing pancakes. "Mix a pancake, stir a pancake, pop it in the pan. Fry a pancake, toss a pancake, catch it if you can!" Turn the page and you'll see the pig from the kitchen scene making a dash to catch the pancake that has just been tossed. The pig, named Jack, catches the pancake as he jumps over a candlestick, narrowly avoiding a fall. 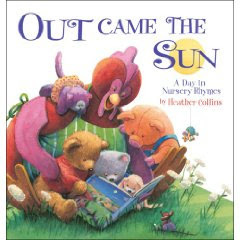 In this manner the book covers a day in the life of a cute set of animals, illustrated by Heather Collins, and covers all the basic nursery rhymes. I really like the fact that it creates a story about what easily comes across as haphazard and confusing to a young one who is "mindlessly" hearing rhyme after unconnected rhyme. We really liked this book and it would probably have to be at the top of our nursery rhyme recommendation list. If you stumble across a copy, pick it up! It'd make a great baby gift as it is interactive and fun. Side note: don't miss my children's book giveaway. Click here to check that out!